Deer photos and information about whitetail deer. Texas White Tail Deer are amazingly beautiful animals. I have hunted before but I now prefer to just watch them. I don't disagree with hunting, and we prepare for for deer season as if we were going to hunt, as far as attracting deer. What happened is that we got good at that. 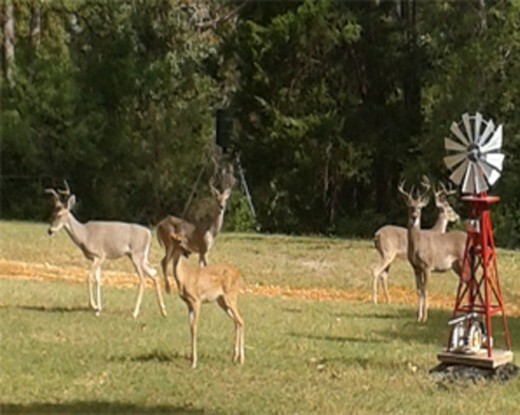 There is no problem attracting deer and having them here day after day. The problem is that they start to become pets in a way that you go out to feed every day. I have raised a couple of deer that were found abandoned and have a separate pages detailing the life of Tinkerbell, one of those deer. 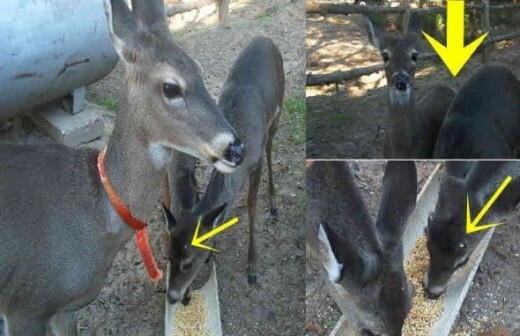 I hope you enjoy the following pictures and information I have to offer on Whitetail Deer. 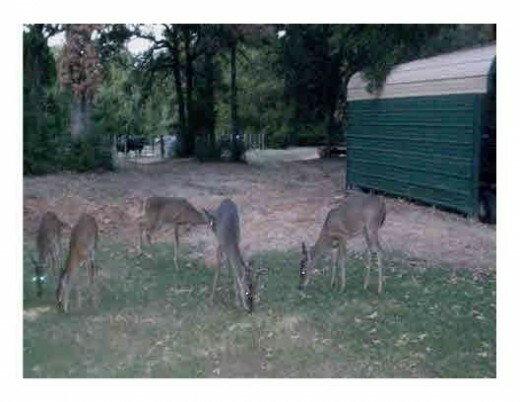 The deer in this picture are from fall 2011. 2011 was a bad year for drought and fires in Texas. This had an impact on all types of wildlife. 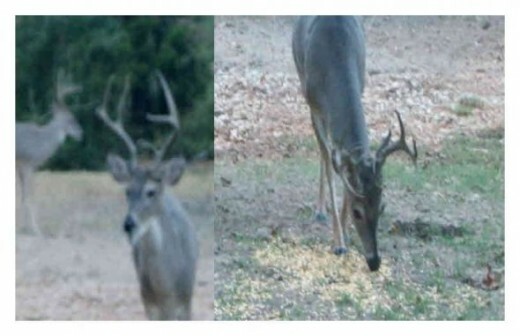 Since we feed deer year round, not just near deer season, the deer remained pretty healthy and had horns the size you would expect for central Texas. That's not to say that it they couldn't have been healthier, but there is little one can do for acres of land with dead grass and trees. There was just no rain. Feeders spread corn every day in different places on the property and there is access to salt and mineral blocks. While making their rounds, many deer make there way up near the house where we put out feed and water. We can sit out and enjoy watching them eat and observe their habits. Most of the time there are 10, 15, 20 deer or more that will travel together and make a stop by the house. The newborn babies will stay put in the woods until the mother decides to bring them out. That will be before they are 3 months old and still have their spots, but I believe it could be as soon as a couple of weeks based on the sizes I have gotten familiar with. 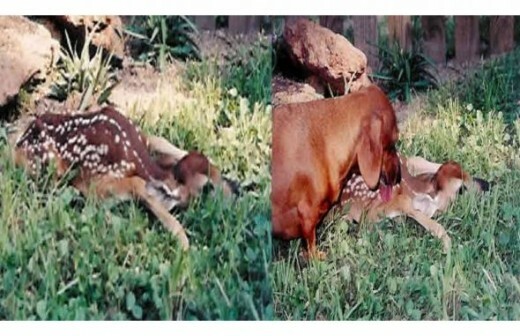 Deer are quiet small when they are born as you can see in the picture compared to our weenie dog. I believe this deer to have been 2-3 days old. This one was found abandoned and covered with ants and no mother in sight. She became Tinkerbell. As you can see there is a difference in the size of the twins. It is clear in the picture above and the one below. 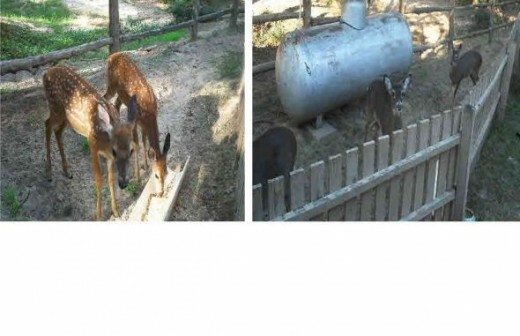 The difference here is that one is buck and one is a doe. You can see that the larger one has started to show the nubs of horns. These deer were born in late June or early July if I remember correctly. While the horns on the buck are starting to grow by this time, he did not have an actual set of horns by deer season in November. Those would develop the following year. These are deer photos were taken in September of 2013. 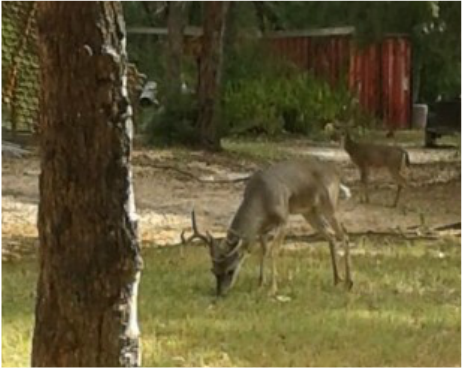 These deer are safe though, no one will be hunting at my place. It is just relaxing and very interesting to sit around and watch them. They don't seem to mind.